Russia has created a highly modified variant of its venerable Mi-24 Hind attack helicopter dubbed the “Prospective Speedy Helicopter” Demonstrator, or Demonstrator PSV. This testbed aircraft aims to take Russian helicopter technology to the next level when it comes to both kinetic performance and avionics. 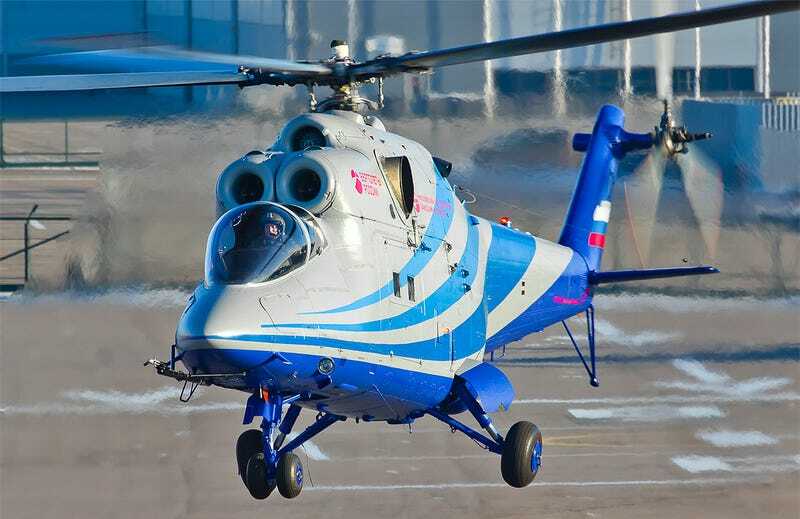 The unique chopper took its first flight on December 23 out of Russian helicopter giant MIL’s plant near Moscow. Designers used the Mi-24K Hind as a starting point for developing this new experimental aircraft, turning the two pilot attack helicopter into a single pilot technology demonstrator. Multiple technologies will be flown on the PSV, including new rotor blade designs and avionics. Today, the PSV is equipped with rotor blades that have curved tips that aim to improve speed and stability at higher speeds. It also has the same Klimov VK-2500 engines found in Russia’s most advanced attack helicopters, the KA-50/52 Black Shark/Alligator and Mi-28 Havoc. Each of its two engines puts out 2,400 horsepower. The aim is for the the PSV to increase cruising speed by 30 percent over the standard Mi-24/35 Hind, achieving 193-194 kts compared to 143 kts on standard models. Top speed is also an area where MIL hopes this new technology demonstrator will show large improvements, with hopes that it will reach a top speed of a whopping 216 kts compared to 180 kts on current models. A 30 percent increase in climb rate is also one of the PSV’s goals. If these new rotors prove their worth, MIL can install them on their Mi-28 attack helicopters (pictured below) starting around 2018, which should increase the helicopter’s cruising and top speed by 10 and 13 percent. Similar rotors could also be fitted to Mi-8/17 and Mi-24/35 helicopters, which have been produced in huge numbers over nearly half a century an continue to be built today. Curved rotor tips also are known to decrease the audible output of a rotor system, although it is unclear if this is one of MIL’s aims with their PSV testbed. A new avionics concept is also being tested aboard this unique helo, including a modular avionics concept with open architecture developed by the Russian electronics firm KERT. This system could be adapted to a whole slew of Russian helicopters, both old and new, and would make future upgrades and enhancements much easier than with current avionics systems used by Russian helicopters. KERT also claims it will improve flight safety and drastically decrease manufacturing costs. Although this technology demonstrator is a start, and will be a surrogate for reasonable upgrades of existing Russian helicopters, it will not achieve a drastic leap in performance that the Ministry of Defense is looking for. As such, it is supposedly the first step in a more ambitious and long-term project to see helicopter speeds jump dramatically. This will require Russia’s helicopter firms, namely MIL and Kamov, to come up with pusher-prop or tilt-rotor technology similar to what is utilized on the Sikorsky S-97 Raider and Bell V-280 Valor, or some other exotic design concept. All this requires quite a bit of money, and although Russia’s helicopter exports are substantial, the country’s Ministry of Defense will have to come up with the cash. Considering how Russia is having trouble buying the advanced weapons it has already developed, plunging oil prices, and its deepening involvement in Syria, this is doubtful. If the Ministry of Defense comes to the conclusion that a more ambitious high-speed helicopter project is not economically feasible in the near term, the PSV demonstrator may become more valuable than ever envisioned. It can buy Russia time by introducing smaller improvements in existing helicopter then developing an entirely new high-speed helicopter configuration. Plus, the less ambitious technologies it proves can be easily and most likely economically exported to users of Russian helicopters around the globe. A special thanks to aviation photographer Timofey Nikishin for sharing his outstanding photos with us for this piece. Make sure to check out his work at here and here, there are some amazing shots in his portfolio that are well worth the click.